Misugi™ shower head has bioactive & ionic beads and filter can remove bacteria, heavy metals, chlorine & fluoride, improving blood circulation, immunity, energy levels, mental clarity & overall wellness and absorbing harmful substances in the air, softens and purifies shower water to make your skin and hair smoother and softer. Our Misugi™ Shower Head is equipped with 180 tiny laser-cut water holes, resulting in luxurious high pressure water while still looking after the environment by saving as much as 35% water. Tiny water holes on the strong stainless steel head panel with water-saving effect. Laser perforated technology feature with a flow rate of 6.7-6.8L/minute at 0.25Mpa. Saving the environment, while saving money at the same time. Misugi™ is the first ever Ionic Filtration Shower Head. Thanks to its Award Winning design with special mineral balls, it soft and purifies the water,makes your skin and hair smoother and softer. Shower in chlorine-free water increases higher energy levels and dramatically improves the condition of your family's skin, hair and nails. When showering we breathe dangerous chemicals & absorb them through our skin. 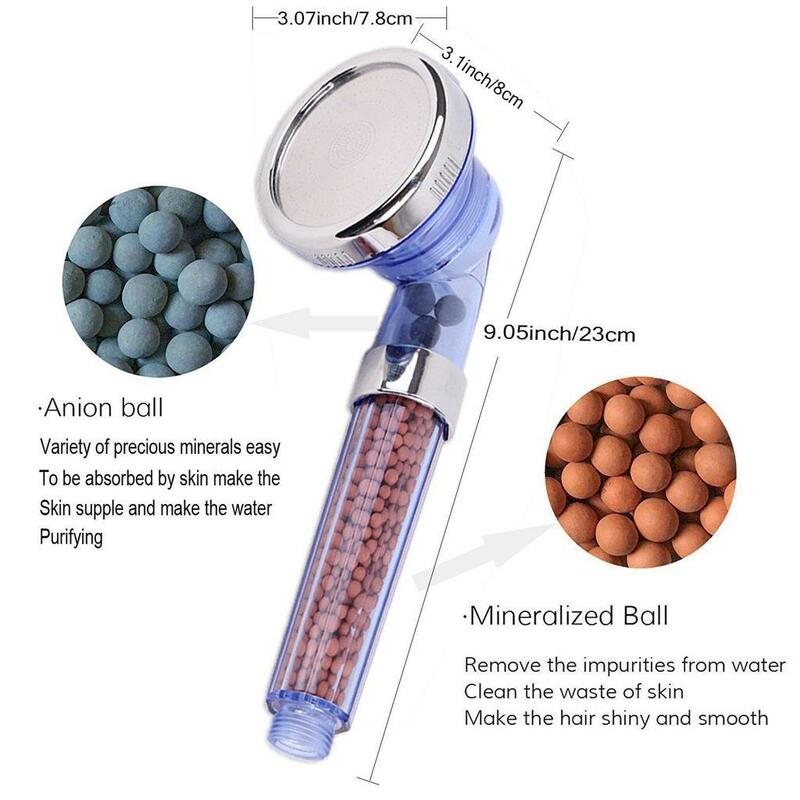 The infrared mineral stone and negative ion mineral stones make up double filter system protecting you reducing chlorine and absorbing harmful substances in the air, softens and purifies shower water to make your skin and hair smoother and softer. The shower head is tight connected and seamless, no worries of breaking, falling and leaking. Every part is easy to disassemble for easy clean. Three type of mineral balls extract chlorine and other toxins from water. Pure and soften water make your hair and skin smooth. he longer end of the hose is suppose to connect with the shower head and the shorter end is suppose to connect with the arm mount. The specially developed Misugi™ Shower Head is made from the highest quality materials that are built to last. Why buy from Awesales, instead of others? We work directly with manufacturers all over the world to ensure the best quality of our products. We have Quality Control department which help us to keep our promise! We want you to be 100% satisfied with services provided from us. If for ANY reason you are not satisfied with your purchase, we offer an iron-clad money back guarantee.